11:30pm, it’s a tough spot to fill. 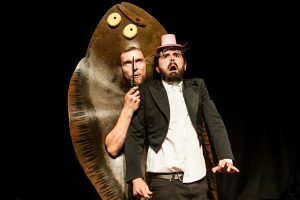 For many the “late night” fringe represents a warped section of incredibly strangely titled shows ranging from The Importance of Being Earnest as Performed by Three F*cking Queens and a Duck to Late Night Gimp Fight. Not that there’s anything wrong with Late Night Gimp Fight. Milk and Blood’s The Dip then, a show with a more muted title. Would that suggest a calmer, more hushed tone? Not in the slightest. Our new stoner mate Al is struggling to figure out what his feelings mean for his close friend Nic. He knows he wants to kiss him though he’s not quite sure when, how or even if he should. He thinks he might be straight but again, he’s not sure. However before he can think any further on the matter, the seemingly copious amount of drugs that Al has consumed take hold of him. He is arrested by the Baba Ganoush Gestapo. What follows is a fever dream-esque, sometimes seemingly non-correlating series of events linked together loosely by ambiguous references to the next ridiculous sounding set of characters. Nic’s likeness morphs into the form of office clerk Nicole, a beautifully ironic representation of Al’s frustration and confusion over whether gender matters to him. As he’s led through the bureaucratic process it becomes clear that whatever Al feels, he wants to kiss Nic/Nicole – whatever form he takes. Following a whirlwind romance, Al finds himself in a dizzying psychonautic maze – stumbling through his own wedding, subsequent escape and an encounter with a homophobic police fish. This jock is quick to bash Al’s current predicament which angers him into working out that he doesn’t really need to worry about what anyone else thinks about his sexuality, least of all himself. This is a raucously ambitious piece of theatre that is impeccably executed to a paradoxical strict looseness. It is both simultaneously incredibly important and unimportant. A wonderful mesh of craziness that is an unstoppable laughter machine. This lies heavily in and shows clearly through the vision of writer/director Eifion Ap Cadno. This is a piece which approaches perceptions about LGBTQ+ issues head on and tackles it’s subject matter in an accessible manner no matter where you sit on the spectrum of sexuality. The on stage chemistry between Will Harrison’s Al and Max Young’s Nic/Nicole is palpable. It can be tasted in the air, and it’s really very lovely – if at points displayed to the audience in a very daring manner. Harrison’s tone of voice carries the weight one would expect in this situation and his exploration of hallucinogen-induced mania is poignant and well received by the audience throughout. Young gives an honest, remarkably well performed voice to Nic and the audience’s eye rests almost immediately upon him every time he enters the stage. This is a piece defined by it’s ensemble of strange characters. Iulia Isar’s short but sweet performance as the Reverend is hysterical, while not enough can be said of Nick Mauldin’s Officer Flatfish. It simply has to been seen to be believed. My one quibble with The Dip is a specific one. A particularly notable and confusing fourth wall break section is a sore thumb on an otherwise gleaming hand. I’ve never been a particular fan of the recent ‘play gone wrong’ trope and this is sadly no exception. Unpredictability is a great device to create an entertaining and riveting narrative, but it shouldn’t be sacrificed for complete audience detachment. This is merely a small criticism for a show which, as is clearly demonstrated by the above, is sure to be a gem of this year’s Fringe offerings. I say that even in these very early days with a degree of confidence. The late night line up is changing, and The Dip proves that this change is for the better. The Dip will run until the 25th August with days off on the 12th and 19th at 11:30pm, TheSpace @ Surgeons Hall in Edinburgh. Tickets available from the Fringe Box Office. Recommended drink: Something with high MDMA content.